We cannot always built the future for your youth, but we can built our youth for the future,”- Franklin D. Roosevelt. In the dawning of an era where parenting is merely an extension of submission to a kid’s demands, you might believe that makes the little one happy. By that, you believe to conceal your own guilt of compensation with money for time. Parenting is not merely supporting the growth of a child but to have active participation in the growth. There is no way we can prepare tomorrow to suit our kind’s requirements, but we can surely modify our kids today, to prepare them for their tomorrow. Here’s what, if you teach your child once, it will remain as a legacy with them and beyond. Discipline is inevitable and this your child should know. All notorious and fun deeds apart, you should never compromise with the discipline, or maybe then be prepared to bear the brunt of it long after they are adults and beyond, if they refuse to take commands for their discipline, they are obliged to take command for their punishment. Win with humility and to lose with grace, and if your child’s a foul loser-try and point out where he went wrong. Most often than not parents are overpowering with their quest for their child to ace and often end up making the child a foul loser. It is mandatory for you to instill in kid’s minds that winning and losing has to happens and that you would appreciate the efforts even if they lose. Even when your child wins, make it a point to walk up to who didn’t win and congratulate them for the effort. Your child often tends to be scared of being reprimanded on losing and that makes them foul losers. A habit children often pick up is to lie and be dishonest, but the most morally important life lesson you need to teach them without fail is to learn to be honest, no matter what the consequences. They might have been dishonest for good, but they need to know that dishonesty is not good. Children today, in their abundance of materialism seem to lose out on the basic human quality, like charity. If your child has begun to look down on the poor and does not donate readily to them, it is the time you realize that sensitivity is losing out on him. He needs to know, the life of living with little to help others, gain a life of more. Negativity can not only tarnish you child’s image with others but will sooner or later lead him to self-destruction too, hence it is the indispensible duty of a parent to make the child see the bad in himself and thereby realize the good in others, and not play the blame game and own up to the mistakes he has made, no matter what the consequences. Owning up to mistake is almost half undoing it. Punctuality and hard work are the biggest virtues and milestones to success. However they don’t come on their own. Set them a target and once they achieve it, they may get a reward of their choice. This is a guaranteed way of getting your child to be on time and to work hard too. You need to teach a child to fear God, to respect all and believe in love. Respecting people automatically reduces all other vices from their view of you. Being God fearing automatically inculcates in you all virtues, for you know you’d be punished for the vices. Loving one and all will make you believe in the unity of mankind and to be optimistic about yourself and the world. Life is a never ending journey. It is a continuous process which goes on and on. Change is inevitable. All though change sometimes disturbs the comfort zone but still it brings in new ideas and is just like a breath of fresh air. The fruit of change brings happiness which results in internal peace. Each day is a celebration of life and this makes it more charming. In order to achieve something in life, one should’ say to oneself, I am the best; I can do it; I am a winner; God is always with me. This surely influences life and makes you confident of achieving your goals. We should be compassionate and empathetic towards our fellow beings. This will result in shaping the future of our family, society, and country in a positive and progressive direction. So let us join hands and make a sincere effort, channelizing our energy towards a better and a bright future. I take this opportunity to personally thank and appreciate Rev. Fr. Denish Naresh Lobo for his untiring support, guidance and encouragement to each and every Franciscan. He has upheld the tradition of our college and has brought it to the level of an international college with his vision and tireless service. I also want to thank the E-care family for rendering their support to this college. “Let the children come to me”, said Jesus (Mat. 19:14). As I post this message, my heart is full of joy and gratitude to God for my call to the great mission of educating children. I sincerely wish academic excellence of high value for every student of St. Francis’ College. Here we strive to impart to the young the essential values for life which make them also enlightened citizens. I appreciate Master KAUSTUBH KAPOOR, our class XII student, who in his Republic Day speech, called up on his fellow-students to work for a New India, to make our nation an oasis of peace, brotherhood and justice, where women are respected, and where there is no place for caste, politics and corruption. Through E-Care we have been able to come closer to the family of every student. In this way we hope for closer and valuable cooperation of parents and students in our effort towards making education value-based so that our youth in turn build a just and peaceful society, a strong nation. I acknowledge and appreciate the able management of Rev. Fr. Donald, our Manager and Rev. Fr. 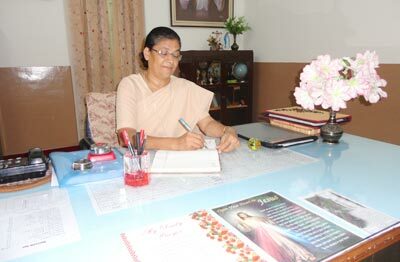 Naresh Lobo, our Principal, Rev. Fr. Stephan Bara, our Vice Principal and the cooperation of all staff who work together to make St. Francis’ College a beacon of hope to the youth, a guide to the future. Children are the joy of today and hope of tomorrow. We need to mould them into self-confident persons, who are self directed learners, capable of independent thinking, and who can perceive the good in their environment, cherish it and nature it. We need to empower the weak link, and effect creative and innovative change in life. 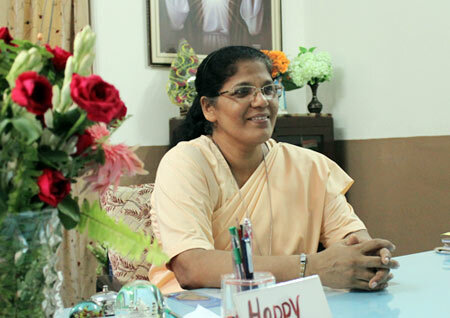 I consider my recent appointment in St. Francis College as Headmistress, a God-given privilege to collaborate with the stalwart Principal, Rev. Fr. Denis Naresh Lobo and the well experienced staff. The modern scientific technology and its product , the E-Care Communication system, which is introduced recently in our esteemed institution, is an incentive to strengthen the administration, parent-teacher-student bond and collaboration of all. This certainly will facilitate interaction with various component of the education system to fulfill our mission. 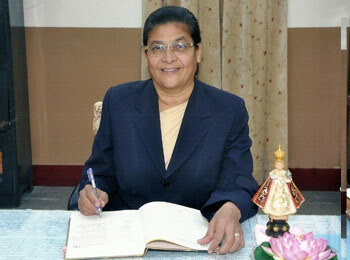 May the Almighty God bless our endeavors in the holistic formation of the students and the bright future of India.